PRINCETON, N.J. -- As South Carolina officials prepare to vote to remove the Confederate flag from the state capitol grounds, a diminished majority of Americans, 54%, down from 59% in 2000 and 69% in 1992, now view the Confederate flag as "a symbol of Southern pride" rather than "a symbol of racism." Democrats' views have shifted from a solid 61% majority viewing the flag as a symbol of Southern pride in 1992 to just 32% holding that view today. Republicans' views are largely unchanged. Gallup conducted the July 1-5 poll in the days before the Republican-dominated South Carolina Senate voted to remove the Confederate flag from the state capitol's grounds. The South Carolina House, which will take up the measure next, needs a two-thirds majority to pass it before a supportive Republican governor can sign the bill. Gallup's prior poll on the matter, in May 2000, came as an NAACP-led boycott of the state pressured South Carolina to remove the Confederate flag from the top of the state's capitol dome. The government at that time voted for a compromise measure moving the flag to another spot on the capitol grounds. The issue was reignited last month when a young white male, who had posed for pictures with the Confederate flag, shot and killed nine black members of a South Carolina church. Whereas 54% of Americans today view the Confederate flag as a symbol of Southern pride, 34%, including 58% of Democrats, believe it to be a racist symbol. The percentage of Democrats viewing the flag as racist is up from 31% in 1992 and 40% in 2000. Americans are divided when asked about Southern states displaying the Confederate flag on official state property. Currently, 47% believe it is all right for them to display the flag on government property or on special license plates available in certain states, while 46% say Southern state governments should stop these practices. In recent weeks, Alabama, Virginia and Georgia as well as South Carolina have made moves to remove the Confederate flag from state property. Previously, Gallup asked a similar question about the appropriateness of Southern states flying the Confederate flag on top of state capitol buildings. In May 2000, Americans were divided on the matter. In 1992, they were more accepting of the practice, with 55% in favor and 40% opposed. 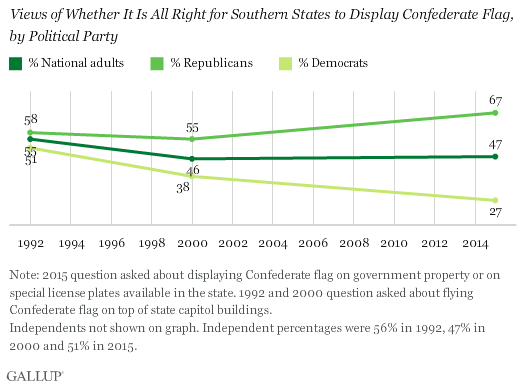 Republicans generally have endorsed Southern states displaying the Confederate flag, including 67% who support it today. Democrats shared that endorsement in 1992 -- with 51% saying it was OK to fly the flag on state capitol buildings -- but now only 27% believe Southern state governments should display the Confederate flag on government property or license plates. The Confederate flag arguably has greater significance for blacks and Southern residents than for most other Americans. 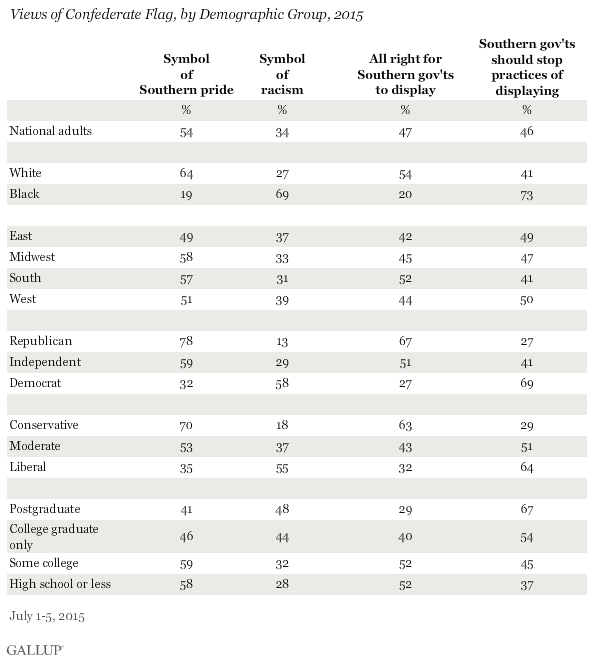 Blacks are, not surprisingly, quite negative in their views of the flag, with 69% believing it is a symbol of racism and 73% saying Southern governments should stop displaying it on government property. Differences by region, on the other hand, are not as large. Southern residents are slightly more likely than those living in other parts of the country to endorse state governments' display of Confederate symbols, but they are no more likely than Midwesterners to view it as a symbol of Southern pride. Regional differences in the current poll are largely similar to what Gallup measured in 1992, even as many more Americans have migrated to the South from other parts of the country. The greatest differences in views of the Confederate flag are by political party identification, particularly on the question of whether it is all right for Southern states to display it on government property. Differences by political ideology are nearly as large, with conservatives generally positive and liberals generally negative toward the flag. Education also has a significant relationship with Americans' views of the Confederate flag: Those with more formal education tend to be more negative toward the flag. Only 29% of postgraduates believe it is OK for Southern states to display the flag on government property, compared with 52% of college graduates only who say the same. 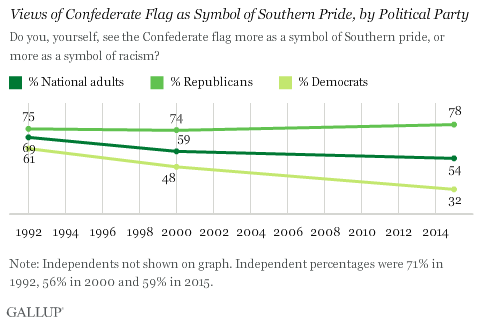 As on many other issues, including gun control, abortion and global warming, Republicans' and Democrats' views of the Confederate flag have grown apart. As recently as 1992, a majority of both Democrats and Republicans said the Confederate flag was more a sign of Southern pride than of racism, and both groups were comfortable with Southern states flying the flag on state capitol buildings. Since the early 1990s, the political parties have become more ideologically homogeneous, mostly because conservative Southern whites who were formerly aligned with the Democratic Party have realigned and are now solidly Republican, as evidenced in their voting for federal and state offices. Today's Democratic Party, with white liberals and racial and ethnic minorities at its core, takes a much more negative view of the Confederate flag. Fewer Southern states display the Confederate flag in some fashion today than did so in the past, but these changes have not been necessarily driven by widespread public opposition in the South or the U.S. more generally. Although Americans tend to have a more positive than negative view of what the Confederate flag symbolizes, that level of positivity is less than it was two decades ago. Americans today are also divided on Southern governments' displaying of the flag, which, combined with the sensitivity of the issue, may be enough to motivate even Republican-dominated Southern states to remove the Confederate flag. 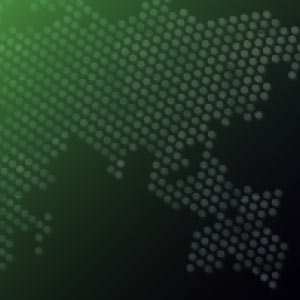 Results for this Gallup poll are based on telephone interviews conducted July 1-3 and 5, 2015, on the Gallup U.S. Daily survey, with a random sample of 2,013 adults, aged 18 and older, living in all 50 U.S. states and the District of Columbia. For results based on the total sample of national adults, the margin of sampling error is ±3 percentage points at the 95% confidence level. All reported margins of sampling error include computed design effects for weighting. This Independence Day, most in the U.S. are proud to be an American, including 54% who say they are "extremely proud" and 27% who are "very proud." The percentage saying they are "extremely proud" is down from a decade ago. Democrats have regained an advantage over Republicans in terms of Americans' party affiliation after three successive quarters in which preferences were evenly divided.